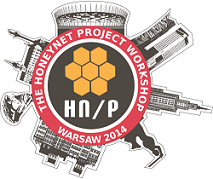 We'd like to thank our existing sponsors and organizers for their support of the 2014 Honeynet Project Workshop. Operating within the structures of NASK, CERT Polska is Poland’s first computer security incident response team. Active since 1996, it has become a recognized and experienced entity in the field of digital forensics and incident response, providing watch & warning services to the Polish community. CERT Polska also conducts extensive R&D into security topics (including EU and NATO projects), designing systems and tools to aid network threat detection and analysis. It is a member of FIRST, TF-CSIRT, APWG and accredited by Trusted Introducer. The European Union Agency for Network and Information Security (ENISA) is a centre of network and information security expertise for the EU, its member states, the private sector and Europe's citizens. ENISA works with these groups to develop advice and recommendations on good practice in information security. It assists EU member states in implementing relevant EU legislation and works to improve the resilience of Europe's critical information infrastructure and networks. ENISA seeks to enhance existing expertise in EU member states by supporting the development of cross-border communities committed to improving network and information security throughout the EU. More information about ENISA and its work can be found at www.enisa.europa.eu. NASK is a research institute which conducts scientific, research and development activities in the area of security, reliability and efficiency of ICT networks. NASK is the Polish national registry of Internet names in the .pl domain. It also serves as the data networks operator. In the framework of NASK operates CERT Polska – a team dedicated to responding to network security breaches. The Forum of Incident Response and Security Teams (FIRST www.first.org ) is the premier organization and recognized global leader in incident response. Membership in FIRST enables incident response teams to more effectively respond to security incidents reactive as well as proactive. FIRST brings together a variety of computer security incident response teams from government, commercial, and educational organizations. FIRST aims to foster cooperation and coordination in incident prevention, to stimulate rapid reaction to incidents, and to promote information sharing among members and the community at large. Apart from the trust network that FIRST forms in the global incident response community, FIRST also provides value added services as access to up-to-date best practice documents, technical colloquia and symposia for security experts, hands-on classes, annual incident response conference, publications and webservices, special interest groups and committees. Currently FIRST has nearly 300 members, spread over Africa, the Americas, Asia, Europe and Oceania. At PwC we believe that confidence in digital future is essential to the growth of business. That’s why we have the largest practice of IT and information security in the world, employing over 3 500 highly qualified professionals in the field of information security, with over 1 200 in Europe. Every year, our company carries out globally over 20 000 projects in the fields of security, of which 75% are consulting projects or assurance, and 25% are associated with the implementation of security solutions. In CEE, PwC Cyber Security Team relies on experts with many years of experience in the role of heads of IT security or key specialists largest technology companies and financial services in Poland, and experienced security auditors. As a result, we are able to be your trusted partner for fully understands the needs and challenges faced by you. Services we provide include the following: Information security strategy, Information security management, Threat and vulnerability management, Architecture, application and network security, infrastructure, Incident handling, monitoring, investigations, Business continuity planning and disaster recovery. Our cyber security service delivery team includes incident response, legal, risk, technology and change management specialists. Codenomicon develops proactive security testing software and situation awareness tools that help you discover the problems at the earliest possible moment. Managing modern networks or critical infrastructure requires awareness of the threats and making informed decisions quickly. For that, it is essential to acquire relevant information, and understand the relationship between individual events. We help organizations turn into more challenging targets as an efficient strategy to reduce operational risks and costs. The increasing network interconnectivity and complexity, combined with high traffic levels, reduces network visibility and creates new attack vectors. Situation awareness is more important than ever but harder to achieve than before. The amount of information that needs to be collected and handled can be overwhelming. Niebezpiecznik.pl is the biggest and the most popular website dedicated entirely to the topic of network & computer security. It is created by professionals for professionals. Niebezpiecznik.pl publishes the news from the ITSEC field and its own materials which are thought as practical advice. We know the difference between a hacker and a cracker, we do not constantly explain what phishing and MITM attack are - moreover, mistaking authentication for authorization makes us just as angry as flat cola does… We also conduct courses in the safety of computer networks as well as web and mobile applications – the materials presented on them result from practice, since on a regular basis we perform audits of computer networks and websites for the biggest companies in both Poland and abroad. If you want to learn how to protect your computer from intruders, read http://niebezpiecznik.pl. Sekurak.pl is a security blog which prefers quality instead of quantity. We aim for IT security technical publications - our own security research, our readers' research and interesting international research. Sekurak.pl also provides interactive CTFs (sekurak.pl/tag/hackme ) with the goal of increasing security knowledge of our fans. The Faculty of Electronics and Information Technology of the Warsaw University of Technology (FE&ITWUT) was officially established in 1951, although for the previous 30 years it functioned as the Low Current Section of the Faculty of Electricity. Over the years it has gradually grown in size and today with around 3500 day-time students it is probably the largest faculty of any kind in Poland. As the Faculty has always adhered to the highest standards, it has been year-on-year nationally ranked the top IT faculty in teaching, as well as obtaining many awards in research. The Faculty has currently more than 20 thousand alumni, who are active professionally not only in Poland but throughout the whole world. To integrate this community, as well as to support the Faculty and its alumni, an Alumni Association was created in the year of the 60th Anniversary of the Faculty. The Association is active in such fields as management training, job search as well as networking. It is also very visible by way of electronic media, including managing by far the biggest alumni/academic group in Poland on the Linkedin.